How to do the smallest thing today on the path to your biggest dreams — on your terms! How to do the smallest thing today on the path to your biggest dreams — on your terms! If you find yourself exhausted at the end of your day rather than expanded, it may be that you have lived your day on everyone else’s terms, and not your own. Yes, amidst your busyness, have you considered that you may be living your life on everyone else’s terms and giving away your power to live the day and the life that you want? With some simple daily practices and awareness exercises, you can transform your day, and your life, into one in which you set the terms and take charge of your journey to happiness and fulfillment. But how do you live your day, and your life, on your terms without falling victim to our greatest fears — failing others? Failing your boss, your colleagues, your spouse, partner, parents, parents-in-law, children, pets — and the list goes on. You know it well! I knew that list well throughout my life. Until I “pressed pause” and came face-to-face with the truth of my life, I couldn’t take charge and live on my terms. My “truth,” my “story,” was one that is common to many of us — needing to prove that I was worthy and to feel good about myself. For me, the root of that story was living through a childhood of sexual abuse. The root of that comes from different places in each of us, but it drives the same behaviors that often cause us to live on terms defined by our limiting selves, rather than on terms defined by our unlimiting selves. So, how do we step out of terms defined by our limiting selves, and step into daily habits that enable us to take charge and live our lives on terms defined by our most powerful and unlimiting selves? Before we can step into daily changes, we need to be “press pause” to reflect on the bigger picture of our lives and see the things that are driving our behaviors — sometimes unconsciously. Until we dare to look within and see our blockages, we cannot fearlessly step forward into meaningful change that will make us truly happy. What is the “truth” of your limiting story that binds you to your limiting beliefs and living on the terms of others? Who and what events in your life caused you to feel limited? When you look at your life, who is standing at the control panels? Do you want them to be at the controls? If you could create your most joyous and meaningful tomorrow, what would that look like? Who is in the picture? What are you doing — for the health you desire, the activities that fill you with purpose, the love you want, the play you want, the peace you seek? Here are some small steps to try for yourself — today. Choose just one to which you can commit today, then another tomorrow. With each day, make a choice for you, and make it happen — one day at a time. For each change to which you can commit and maintain for 30 days, you will create new habits that will become the new terms you set for your day and your life. Importantly, remember that with each choice you make for you, you will not be “failing” others. Rather, you will be better fulfilling others as you better fulfill yourself. Choose a different story you can tell yourself before you get out of bed that matches your dreams for yourself. Just as easily as you can be trapped by your limiting story, you can release yourself by choosing to place more belief in your unlimiting story. Create your own positive mantra for the day. Start simply, for example, “Today, I am good enough,” “Today, I am worthy enough,” “Today, I am capable enough,” “Today, I am strong enough,” “Today, I am confident enough,” “Today, I am more than enough for anything I want to do.” Michelangelo said, “I saw an angel in the marble, and carved until I set him free.” Each day, see the angel within you, and keep setting yourself free with beliefs that match your dreams. Choose a positive state of being for the day and commit to staying in that state no matter what happens. For example, commit to staying in joy, gratitude, or peace. Set your “being boundary” and don’t allow the things around you to break your boundary. If you feel your boundary challenged, seek refuge in your breath. Breathe in and feel joy, gratitude, peace or the other state you have chosen for yourself. Breathe out and release any disturbing emotions. With each “in” breath, feel your positive state grow. With each “out” breath, feel your disturbing state fade. Keep focusing on your breath until you feel centered and strong in your chosen state of being. Choose a specific area of your life in which you seek change and identify the smallest step you can take today. For example, if it’s your eating habits, choose the one smallest thing you can do today: you may want to eat no more than 50 grams of carbs throughout the day, drink two glasses of water before you leave for work, drink one less cup of coffee, drink one less soda, swap your sugar snack to a vegetable snack, take a 20-minute walk during the day (consult with your doctor if you are unsure of the right nutritional change). Make the change measurable and commit to maintaining it for 30 days. Notice the difference in the way you feel physically and mentally by simply making a small positive choice for yourself and sticking to it. Research shows that people who make choices for themselves are healthier and happier than those who don’t. So, just make a choice, and make it happen. 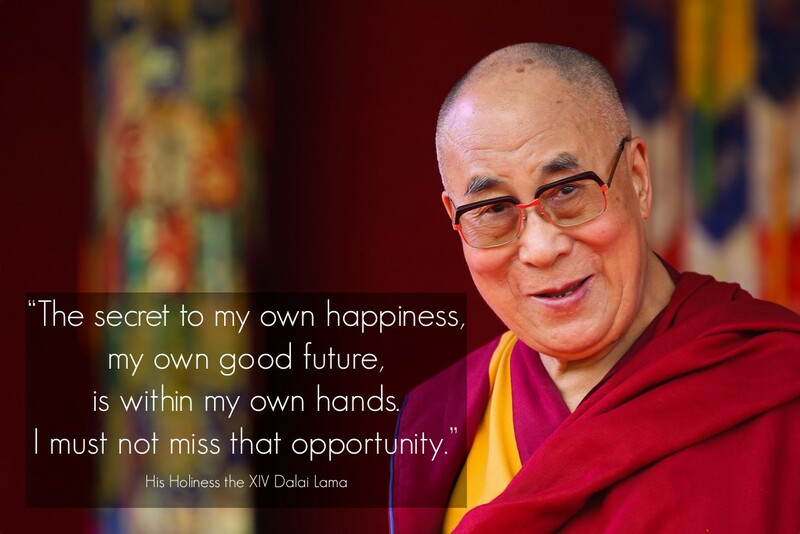 The Dalai Lama encourages us, “The secret to my own happiness, my own good future, is within my own hands. I must not miss that opportunity.” Today, don’t miss your opportunity to do the smallest thing you can do on the path to your biggest dreams. Create moments of joy, gratitude and happiness for yourself throughout the day. One of the best ways to rejuvenate yourself during the day is to naturally boost the neurochemicals that make you feel happy, confident and energized. There are a few ways you can do this — and you don’t even need to leave your seat, but you will feel even better if you do! The first is simply to visualize a scene that brings you joy and happiness — this could be of a loved one, nature, a happy memory, a proud accomplishment, or any other memory that comes to mind. Simply close your eyes and feel the joy and happiness for even just a minute. Open your eyes and allow those feelings to stay with you. The second is to create a physical moment of joy and happiness — perhaps that is walking to a nearby park, taking off your shoes and feeling the grass beneath your feet; perhaps it is taking an extra ten minutes to play with your children; perhaps it is simply walking out of your office and finding a place to see all that is around you — a tree, a flower, grass, sky — and be grateful for all that is. These may seem like small and even insignificant steps. Yet, research shows that when we take small steps for ourselves each day, we start to re-train our brains and our being in ways that enable us to make positive progress toward the bigger dreams we have for ourselves. So, trust yourself, follow your inner wisdom, and take flight. Before you know it, your days and your life will become filled with happiness, meaning and fulfillment as you take charge, make choices for you, and live your day, and your life, on your terms — for the benefit of you and all.